Milwaukee had a bad spell for the franchise from 1983 – 2007, where the club didn’t make the playoffs at all. Once Ryan Braun asserted himself on the team, the club started its transformation into a club capable of making it to the playoffs in any season. They made the 2008 postseason for the 1st time in 26 years, and 2011 saw them make it to the NLCS – before bowing out to the Cardinals. Their team had to fight through the Ryan Braun saga’s of 2012 and 2013, and now this team is back leading the NL Central in 2014. The teams lineup has been built with draft picks, smart acquisitions, and key waiver wire pick ups. Mark Attanasio and Doug Melvin have been aggressive of the brass for the ‘Brew Crew’ over the last half a dozen years. They have made strides to make the team relevant – by making trades for ALL – Star Pitchers, but they have also done some great drafting on the offensive side. Ryan Braun, Jonathan Lucroy, Khris Davis, Scooter Gennett and Rickie Weeks were all great draft selections in the lineup, while Carlos Gomez was acquired by trading another great player in J.J. Hardy. You also have a bench player like Logan Schafer drafted by the squad. Add in some veteran leadership with Aramis Ramirez, Mark Reynolds and Lyle Overbay, and some waiver and low prospect Free Agent deals for Martin Maldonado, Jeff Bianchi and Elian Herrera. 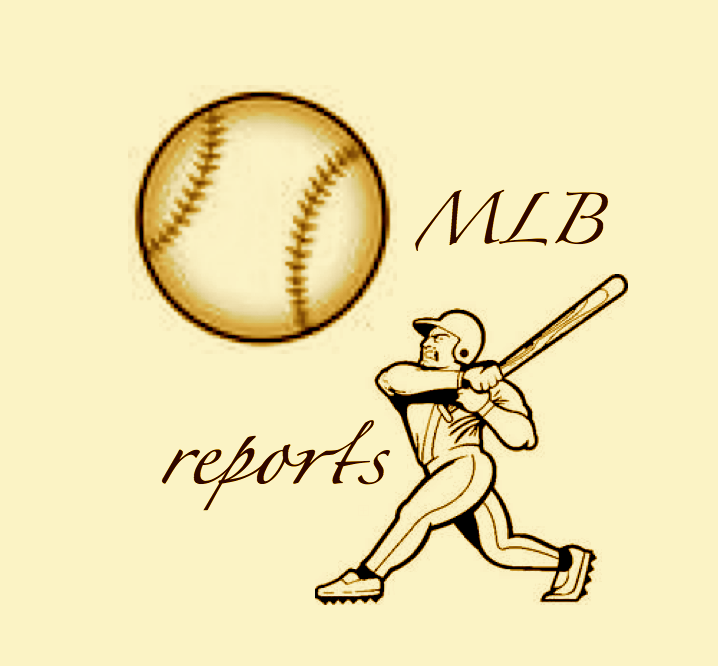 MLB Reports “Junior Reporter” Haley Smilow Interviews Rickie Weeks! Haley Smilow is at it again. This time Milwaukee Brewers 2B Rickie Weeks was on the other end of her questions. Our Junior Reporter has now interviewed several players in the MLB over the last 2 years. Not only that, Haley and her family have been on an epic journey to view all 30 MLB Parks. It wasn’t so long ago that the Brewers carried Prince Fielder, Ryan Braun and Zack Greinke on the same squad. The 2013 season represented the worst year Milwaukee has seen since Braun entered the league. It also featured several Brewers players fighting the injury plague, or having career worst years. I guess asking Aramis Ramirez to play consecutive healthy seasons was too much ask? The team’s attendance also dropped another 300K+ – and finished 9th overall for the NL. But who could blame them when their superstar took a 65 game suspension – and was drinking Pina Colada’s in Hawaii – while his team suffered in Wisconsin? 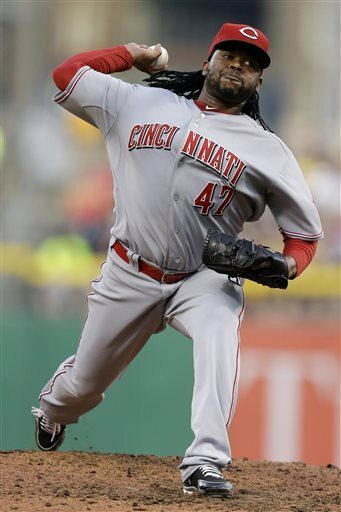 Johnny Cueto let up only one and one walk over 8 shutout innings as the Reds defeated the Pirates 6-0. Jonathan Lucroy went 5-5 with two homers, three runs scored and four runs batted in as the Brewers topped Philadelphia 8-5. Chris Dickerson crushed a 2 out, 3 run, walk off, come from behind homer to turn a Baltimore loss into an Oriole 7-5 win over the Tigers and bring the Birds to within 1 game in the loss column of first place. And CC Sabathia shut down the Red Sox into the 8th inning, going 7 1/3 innings, letting up only 1 run, no walks and 10 strikeouts to end the Yankee losing streak, 4-1 and bring them to within a game of first. They all owned baseball on May 31st, 2013. 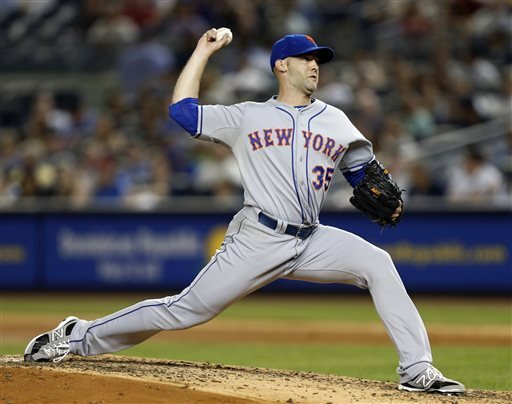 Dillon Gee pitched 7 1/3 innings, letting up one run, 4 hits no walks and 12 strikeouts as the Mets beat the Yankees 3-1 and completed the season sweep of the Subway Series. 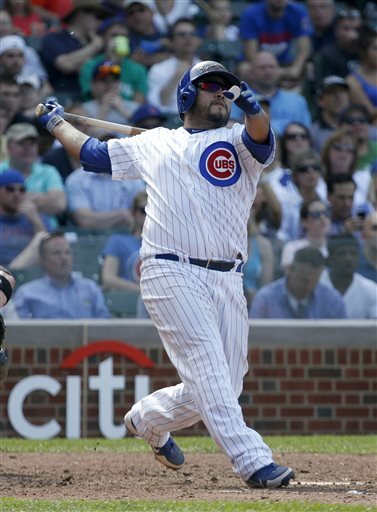 Luis Valbuena went 3-4, a triple shy of the cycle, scoring three runs as the Cubs swept the White Sox with an 8-3 win. Jacoby Ellsbury went on a franchise record setting stolen base binge, swiping 5 bags against the Phillies while getting on base 4 times including 3 hits as the Red Sox beat the Phillies, 9-2. And Freddy Garcia pitched 8 shutout innings, letting up only 3 hits and no walks as the Orioles topped the Nats 2-0. They all owned baseball on May 30th, 2013. Mr. Zimmerman’s night (and baseball ownership) was foiled by the Orioles 9-6 comeback over the Nationals, led by Chris Davis‘ 4-4, 2 homer, 3 RBI performance. 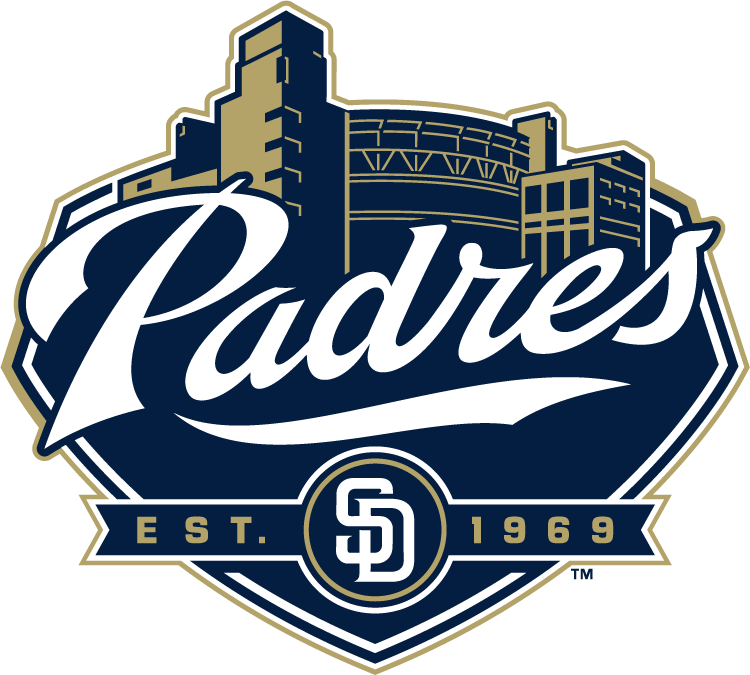 Eric Stults did not get the decision, but his 8 inning, 3 hit, 1 run, 12 strikeout and no walk performance set up the Padres 3-2 10 inning victory over Seattle. Sam Deduno held down the Brewers bats for 7 innings and a single run, letting up 4 hits and 2 walks as the Twins won, 4-1. They all owned baseball on May 28th, 2013. 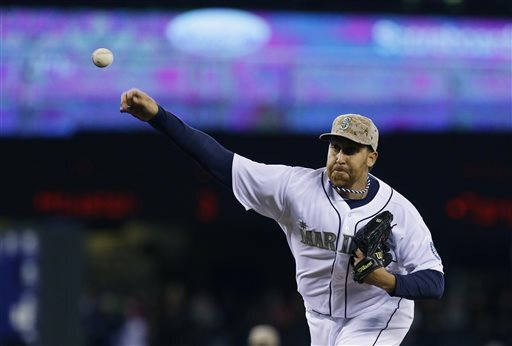 Aaron Harang threw a complete game 4 hit shutout as the Mariners beat the Padres, 9-0. Kelly Johnson went 4-5 with 2 homers and a stolen base as the Rays topped the Marlins, 10-6. Jeff Samardzija went the distance, throwing a two hit shutout over the crosstown White Sox, striking out 8 and walking 2 as the Cubs prevailed, 7-0. And David Wright hit a triple, went 2-3 and his towering home run tied the game in the 7th and sparked the Mets come from behind 2-1 victory in the first game of the Subway Series with the Yankees, 2-1. They all owned baseball on May 27th, 2013. WOB Stands For ‘Who Owned Baseball’ It is based on a Daily Look at the best players from the baseball games the day before. 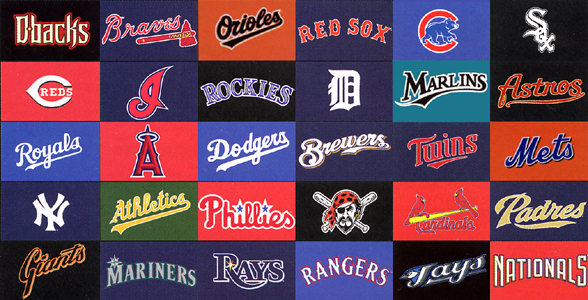 Our Lead Writer – Paul Francis Sullivan – (please call him ‘Sully’), keeps a running total for the yearly leaders every day – and we will update the standings here every day on this page..
Agree or Disagree with him on the players he selects – leave him a comment at info@sullybaseball.com. Follow him on twitter. 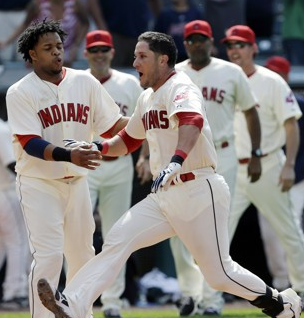 Yan Gomes hit a walk off, come from behind, 3 run homer in the bottom of the 10th to cap off a 3-5 day as the Indians won a bizarre 10-8 game over the Mariners. R. A. Dickey pitched 8 strong innings letting up only 4 hits and 2 earned runs as the Blue Jays got a much needed win over the Rays, 7-5. Brandon Belt went 4-5, homering and scoring 4 times as the Giants demolished the Nationals 8-0. And Patrick Corbin threw his first career complete game, improving to 7-0, as he let up only 3 hits and 1 run in Coors Field, striking out 10 for the Diamondbacks 5-1 win over the Rockies. The Padres have played great baseball since they plugged Chase Headley back in the lineup. Players like Yonder Alonso, Will Venable, Everth Cabrera and even Kyle Blanks have bashed the ball around. Since a lot of the NL West clubs have not run away with the Division, the San Diego club has entered the picture for the Division Race. The Rangers are #1 again based on the Division lead they currently possess, plus the fact they play all of these teams a total of 76 Games this year. The Braves (rose their division lead to 2.5 Games with a 4 – 2 week), and Padres (18 – 13 in their last 31 Games and have been clubbing the ball lateley) were the biggest movers up for the week standings by climbing 6 spots apiece. The biggest drops were the San Francisco Giants (hate their Starting Pitching right now – except for Madison Bumgarner) and the Baltimore Orioles (late inning magic might be dying – and still need a DH + a Veteran Starter or 2). The Los Angeles teams keep losing ball games – and the Blue Jays lost 2 straight versus the Yankees just when they looked to be on track. Cleveland is still ranked outside the top ten because I don’t have faith in their strength of schedule in the next month starting May 21st: 2 vs DET, 4 @BOS, 2 vs CIN, 2 @CIN, 2 vs TB, 3 @NYY, 3 @DET, 3 @TEX, 3 vs WSH and finally 3 vs KC. If they are above .500 after this stretch, I will be impressed. 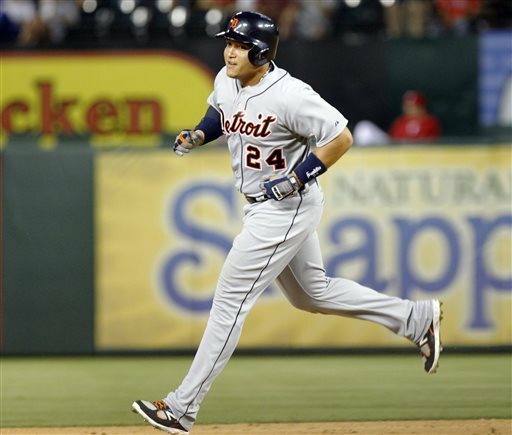 In a losing cause, Miguel Cabrera hit three homers, reached base 5 times, scored three and drove in 5 runs. (His critics would point out that he made an error.) Despite his best efforts, the Tigers lost to Texas 11-8. Matt Moore pitched seven terrific innings, holding the Orioles to a single run. The Tampa Bay Rays won 3-1 and swept a series in Baltimore that could come back to haunt the Birds later. Carlos Gonzalez got on base four times and got RBI hits in the first and fifth as the Rockies blanked the Champion Giants 5-0 in Coors Field. And Ricky Nolasco pitched 8 strong innings, letting up only 1 run and struck out 11 as the Marlins enjoyed a rare win, 2-1 over the Diamondbacks. 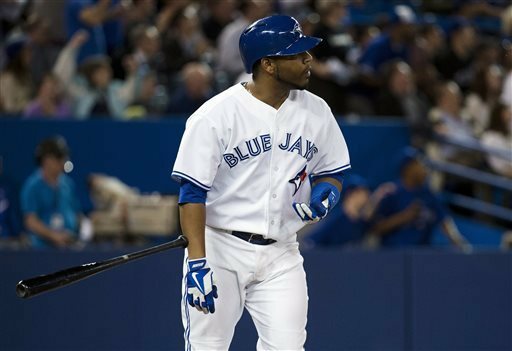 Edwin Encarnacion of the Toronto Blue Jays hit a pair of home runs including the go ahead shot in the 7th inning against first place Boston. Justin Verlander pitched 7 strong innings, striking out 8, as the Tigers beat the Minnesota Twins and kept their spot on the top of the standings. 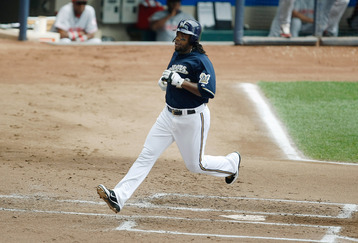 Rickie Weeks of the Brewers got on base four times, scored three times, drove in five and homered as Milwaukee beat Pittsburgh 12-8. And in a night of terrific National League pitching (including wonderful performances from Tim Hudson, Hyun Jin Ryu, Kevin Slowey, Bronson Arroyo, Madison Bumgarner, Trevor Cahill and Jeremy Hefner) it was Jaime Garcia who won the night. He pitched 8 outstanding innings of a tense 2-1 Cardinal victory over the rival Cincinnati Reds. 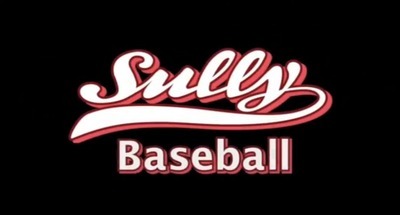 Tags: @sully baseball on twitter, cardinals, cardinals brewers, detroit tigers, edwin encarnacion, Jaime Garcia, justin verlander, milwaukee brewers, Paul Francis Sullivan, rickie weeks, st louis cardinals, Sully Baseball, toronto blue jays, Who owns baseball? Rickie Weeks had a rough 2012 campaign, only hitting .230. He still managed, though, to slug 21 HR and knock in 63 runs. 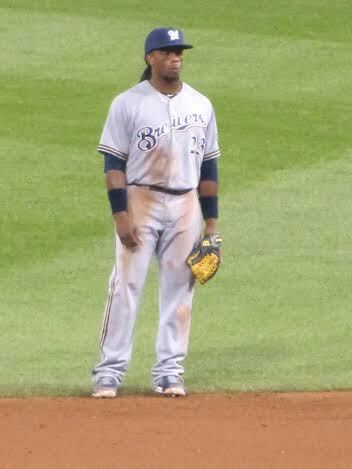 2012 was a long year for Rickie Weeks and the Milwaukee Brewers. Even after Prince Fielder left to sign with the Detroit Tigers, fans had high hopes for the 2012 season. Ryan Braun, Rickie Weeks, and upcoming First Baseman Mat Gamel were all set to bring the Brewers back to the playoffs. Unfortunately Gamel started the season and suffered a torn ACL, which caused him to miss the rest. Braun was caught up in a steroid scandal that threatened to suspend him but never did. Luckily Braun was not suspended and had a very good season. Weeks, on the other hand, had a horrific first half of the year. The Brewers wound up just four games over .500 at 83-79 and finished third in the NL Central. Brewers’ fans hope that 2013 will be different. There is a Hyperlink below to download our American League Podcast. Ryan Braun’s 162 Game Average is scary for Pitches. .37 HRs, 118 RBI, 113 Runs Scored, 41-2B, 23 SB, 200 Hits and a .313/.374/.943 Slash Line. He will be looked upon to carry the Brew Crew for yet another season in 2013. Disastrous? Horrifying? Cataclysmic? Damning? Ruinous? Unfortunately for Milwaukee Brewer baseball fans this small collection of words described the 2012 version of the Milwaukee Brewers bullpen. No season in recent memory has produced as many highs, and as many lows as did the 2012 season. The 2013 Milwaukee Brewers will thrive with an improved bullpen, an upgraded pitching staff, and the continued success of one of the best offensive lineups in baseball. That’s a lot to go right but the ingredients are in place and currently being collected to provide Brewer fans with a World Series contender. Back to the bullpen in 2013: 29 blown saves & ERA’s of 4.67, 4.38, 4.61, 7.68, and 3.63. Yeah, those types of numbers aren’t going to get it done as a Major League bullpen. The 2012 Milwaukee Brewers bullpen was one of the worst in baseball. On a daily basis Brewer fans rode the Bullpen Roller Coaster not knowing if they would survive. Most Brewer fans figured John Axford and Francisco Rodriguez (K-Rod) would level out and perform like that had in the past. Looking at 2011 and 2012 comparisons that Brewer fans logic just didn’t pan-out: Axford 2011 (1.95 ERA, 46 saves, 1.140 WHIP, and 16 earned runs) 2012 (4.67 ERA, 35 saves, 1.442 WHIP, and 36 earned runs): K-Rod 2011 (1.86 ERA, 1.138 WHIP, and 6 earned runs) 2012 (4.38 ERA, 1.333 WHIP, and 35 earned runs). Axford has the potential to bounce back from his poor 2012 season but history is not kind to Brewer closers. Take Derrick Turnbow for example: 2005 (1.74 ERA, 39 saves) 2006 (6.87 ERA, 24 saves) and 2007 (4.63 ERA, 1 save). Hopefully the saying “the best predictor of the future is past behavior” applies with Axford as the Brewers long-term solution at closing games. K-Rod would be a welcome addition back to the bullpen (said no one) so the Brewers will have to look elsewhere for the much-needed bullpen help. Ryan Braun’s 162 Game Average is scary for Pitches. .37 HRs, 118 RBI, 113 Runs Scored, 41-2B, 23 SB, 200 Hits and a .313/.374/.943 Slash Line. 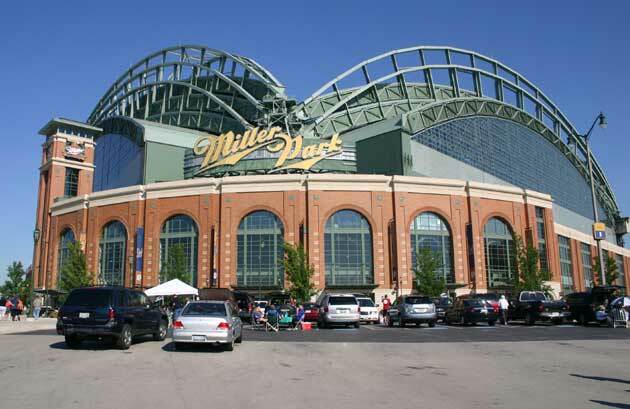 1982….Mention this date to any Brewers fan and immediately you will witness a smile and a nod of the head. Very little has to be said that isn’t communicated with that simple smile and subtle shake of the head. Harvey’s Wallbangers; Cecil Cooper, Paul Molitor, Robin Yount, Gorman Thomas and Ben Oglivie to name a few. Coming off a (3-2) AL Division Series loss to the Yankees in 81′ the Brewers stormed in to 82′ ready to make amends. The Brewers began 82′ slowly going (23-24), thus Harvey Kuenn replaced Buck Rodgers. The Brewers made history going forward posting a (72-43) record leading the league in runs and HRs. This team poured it all out on the field before losing in Game 7 of the World Series to the St. Louis Cardinals. Yount, Molitor and Cooper will forever be household names associated with the epic ’82 team. Fast-Forward 26 years….2008 & 2011….The Brewers finally made it back to the postseason. 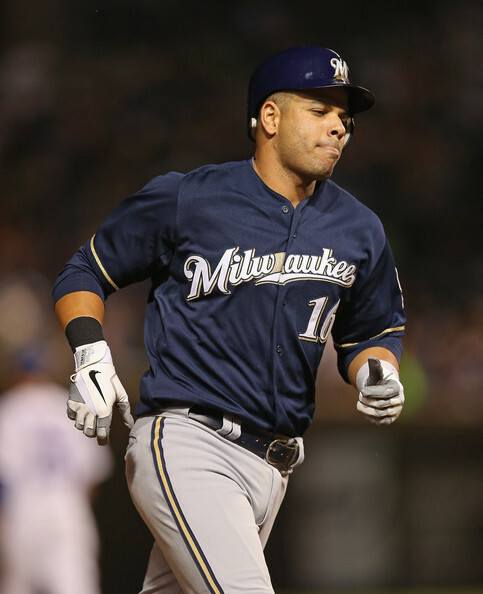 This time the club was led by Ryan Braun, Prince Fielder, Corey Hart and Rickie Weeks. These were both magical years but neither year ended in a World Series appearance. 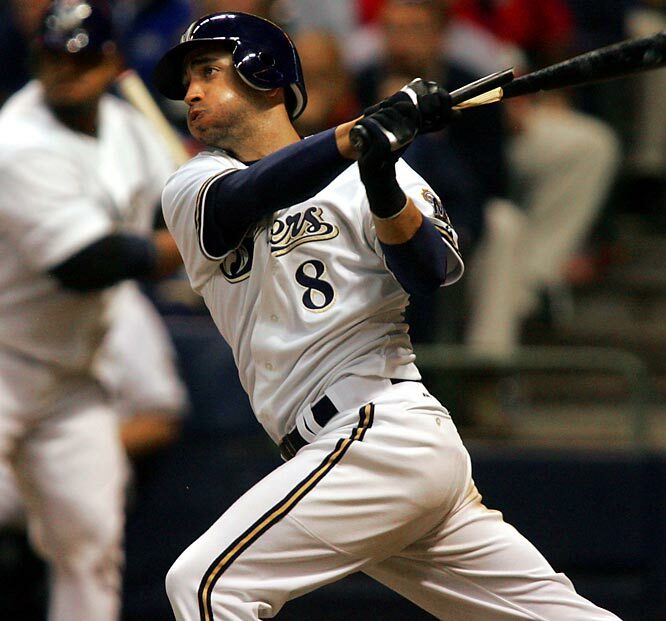 The constant and consistent cog of these two playoff teams was Ryan Braun. The “Hebrew Hammer” lead the team in batting both playoff years and put up power numbers as well as speed numbers. This perennial All-Star continues to perform as one of the best in the game, but how does Ryan Braun compare to the 82′ heroes of Yount, Molitor and Cooper. The following statistics were taken during 6 consecutive seasons for each player (only exception is the 84′ season for Molitor who was limited to 13 games, 85′ season was substituted). John Burns: It is easy to say that Robinson Cano is the best all-around second baseman in baseball right now. Cano has been the top second baseman for a couple of years now. What makes Cano so great is his ability to just flat-out hit and his much improved defense at second base. Cano is having another great season with the Yankees. With a .316 average and 24 homers, Cano has been one of the most feared hitters in the stacked Yankees lineup.